Keys Gate’s Juan Aracena rounds the bases on his third-inning home run. Keys Gate blew a four-run lead in the top of the seventh inning, then came back in the bottom half to earn a walk-off 9-8 victory over visiting St. Brendan on Friday afternoon in a non-district game at Homestead. Frank Fernandez opened the bottom of the seventh with a single and Juan Arcena followed with a single before Jesen Montanez laid down a bunt that was misplayed for one of five St. Brendan errors, allowing the winning run to score. The win lifts the Knights, who also committed five errors, to 5-9 for the season. “We haven’t put it together this season,” said Keys Gate Charter manager Rich Benavides. “We’ve got a talented bunch of kids. We’ve been hitting the ball well for the last two weeks, we just haven’t been on the winning end. St. Brendan broke through for four runs on six hits in the top of the seventh inning to erase an 8-4 deficit. Christian Centeno, Gabriel Diaz, and Sebastian Garrido drove in runs for the Sabres in their dramatic late rally. “We battled the whole way through,” said St. Brendan manager Robert Del Riego, whose Sabres fall to 3-9. “There’s nothing more I can ask of my squad. They don’t quit. I’m very proud of them. The result didn’t come out the way we wanted it to but I’m very proud of my squad. 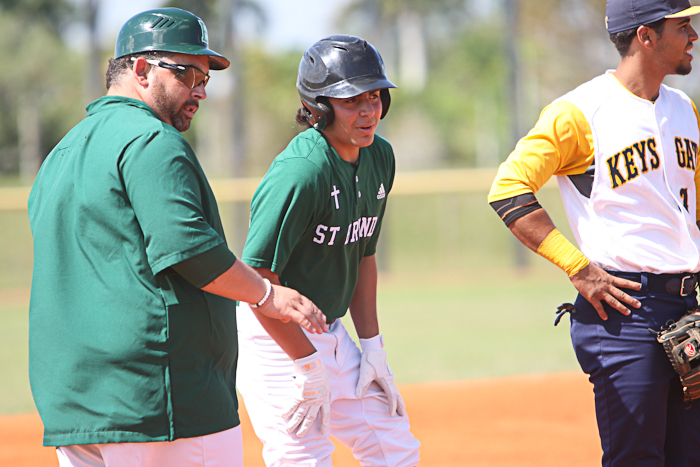 St. Brendan’s Sebastian Garrido collected three hits and drove in two runs. Garrido collected three of the Sabres’ 14 hits and drove in two runs. Arcena highlighted the Knights’ nine-hit attack with a third-inning solo home run that increased the lead to 6-3. “There was no pressure, I just wanted to keep the ball in play to get on base with two strikes,” Arcena said. “All I was thinking about was putting the ball in play and whatever comes out, comes out. I wasn’t expecting (to hit a home run), said Arcena, contributed to the game-winning rally in the bottom of the seventh after his team saw its lead slip away in the top half. 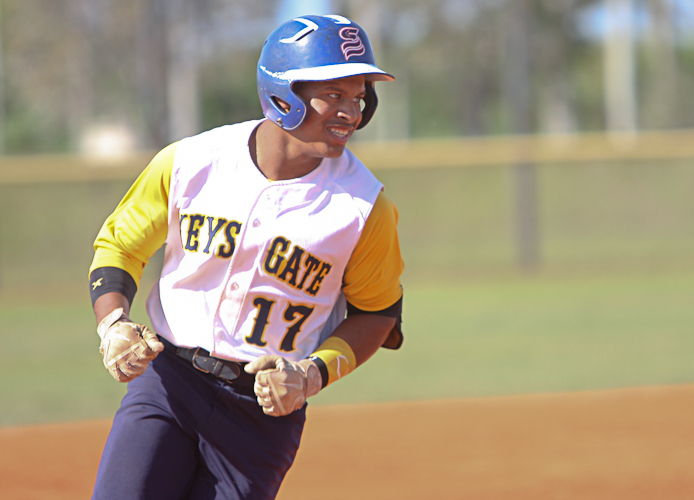 Knights’ leadoff hitter Rey Hernandez reached base four times, stole four bases, and scored a run. Eight different Keys Gate players had hits. Montanez and Rod Alea added two RBIs apiece.